Mona Lisa (also known as La Gioconda) is a sixteenth century portrait painted in oil on a poplar panel by Leonardo da Vinci during the Italian Renaissance. The work is owned by the French government and hangs in the Musée du Louvre in Paris, France with the title Portrait of Lisa Gherardini, wife of Francesco del Giocondo. It is one of the great icons of Western painting, perhaps the best known painting in the entire world. Leonardo da Vinci began painting the Mona Lisa in 1503 (during the Italian Renaissance) and, according to Vasari, "after he had lingered over it four years, left it unfinished…." He is thought to have continued to work on it for three years after he moved to France and to have finished it shortly before he died in 1519. Leonardo took the painting from Italy to France in 1516 when King François I invited the painter to work at the Clos Lucé near the king's castle in Amboise. Most likely through the heirs of Leonardo's assistant Salai, the king bought the painting for 4000 écus and kept it at Fontainebleau, where it remained until given to Louis XIV. Louis XIV moved the painting to the Palace of Versailles. After the French Revolution, it was moved to the Louvre. Napoleon I had it moved to his bedroom in the Tuileries Palace; later it was returned to the Louvre. During the Franco-Prussian War (1870–1871) it was moved from the Louvre to a hiding place elsewhere in France. The sitter's identity was ascertained at the University of Heidelberg in 2005 by a library expert who discovered a 1503 margin note written by Agostino Vespucci. Scholars had been of many minds, identifying at least four different paintings as the Mona Lisa and several people as its subject. 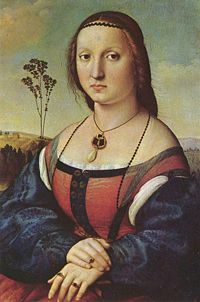 Leonardo's mother Caterina in a distant memory, Isabella of Naples or Aragon, Cecilia Gallerani, Costanza d'Avalos–who was also called the "merry one" or La Gioconda, Isabella d'Este, Pacifica Brandano or Brandino, Isabela Gualanda, Caterina Sforza, and Leonardo himself had all been named the sitter. Today the subject's identity is held to be Lisa, which was always the traditional view. The painting's title stems from a description by Giorgio Vasari in his biography of Leonardo da Vinci published in 1550, 31 years after the artist's death. "Leonardo undertook to paint, for Francesco del Giocondo, the portrait of Mona Lisa, his wife…." (one version in Italian: Prese Lionardo a fare per Francesco del Giocondo il ritratto di mona Lisa sua moglie). In Italian, ma donna means my lady. This became madonna, and its contraction mona. Mona is thus a polite form of address, similar to Ma’am, Madam, or my lady in English. In modern Italian, the short form of madonna is usually spelled Monna, so the title is sometimes Monna Lisa, rarely in English and more commonly in Romance languages such as French and Italian. The woman sits markedly upright with her arms folded, which is also a sign of her reserved posture. Only her gaze is fixed on the observer and seems to welcome him to this silent communication. Since the brightly lit face is practically framed with various much darker elements (hair, veil, shadows), the observer's attraction to Mona Lisa's face is brought to even greater extent. Thus, the composition of the figure evokes an ambiguous effect: we are attracted to this mysterious woman but have to stay at a distance as if she were a divine creature. There is no indication of an intimate dialogue between the woman and the observer as is the case in the Portrait of Baldassare Castiglione (Louvre) painted by Raphael about ten years after Mona Lisa, and undoubtedly influenced by Leonardo's portrait. The painting was among the first portraits to depict the sitter before an imaginary landscape. The enigmatic woman is portrayed seated in what appears to be an open loggia with dark pillar bases on either side. Behind her a vast landscape recedes to icy mountains. Winding paths and a distant bridge give only the slightest indications of human presence. The sensuous curves of the woman's hair and clothing, created through sfumato, are echoed in the undulating imaginary valleys and rivers behind her. The blurred outlines, graceful figure, dramatic contrasts of light and dark, and overall feeling of calm are characteristic of Leonardo's style. Due to the expressive synthesis that Leonardo achieved between sitter and landscape it is arguable whether Mona Lisa should be considered as a traditional portrait, for it represents an ideal rather than a real woman. The sense of overall harmony achieved in the painting—especially apparent in the sitter's faint smile—reflects Leonardo's idea of a link connecting humanity and nature. Mona Lisa has no visible facial hair—including eyebrows and eyelashes. Some researchers claim that it was common at this time for genteel women to pluck them out, since they were considered to be unsightly. For modern viewers the missing eyebrows add to the slightly semi-abstract quality of the face. The Mona Lisa painting now hangs in the Musée du Louvre in Paris, France. The painting's increasing fame was further emphasized when it was stolen on August 21, 1911. The next day, Louis Béroud, a painter, walked into the Louvre and went to the Salon Carré where the Mona Lisa had been on display for five years. However, where the Mona Lisa should have stood, he found four iron pegs. Béroud contacted the section head of the guards, who thought the painting was being photographed for marketing purposes. A few hours later, Béroud checked back with the section head of the museum, and it was confirmed that the Mona Lisa was not with the photographers. The Louvre was closed for an entire week to aid in investigation of the theft. French poet Guillaume Apollinaire, who had once called for the Louvre to be "burnt down," came under suspicion; he was arrested and put in jail. Apollinaire tried to implicate his friend Pablo Picasso, who was also brought in for questioning, but both were later exonerated. 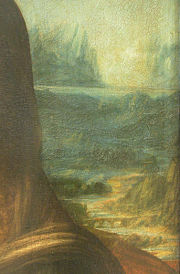 At the time, the painting was believed to be lost forever; it would be two years before the real thief was discovered. Louvre employee Vincenzo Peruggia stole it by entering the building during regular hours, hiding in a broom closet and walking out with it hidden under his coat after the museum had closed. Peruggia was an Italian patriot who believed Leonardo's painting should be returned to Italy for display in an Italian museum. Peruggia may have also been motivated by a friend who sold copies of the painting, which would skyrocket in value after the theft of the original. After keeping the painting in his apartment for two years, Peruggia grew impatient and was finally caught when he attempted to sell it to the directors of the Uffizi Gallery in Florence; it was exhibited all over Italy and returned to the Louvre in 1913. Peruggia was hailed for his patriotism in Italy and only served a few months in jail for the crime. During World War II, the painting was again removed from the Louvre and taken safely, first to Château d'Amboise, then to the Loc-Dieu Abbey and finally to the Ingres Museum in Montauban. In 1956, the lower part of the painting was severely damaged when a vandal doused the painting with acid. On December 30 of that same year, Ugo Ungaza Villegas, a young Bolivian, damaged the painting by throwing a rock at it. This resulted in the loss of a speck of pigment near the left elbow, which was later painted over. The Mona Lisa has survived for more than 500 years, and an international commission convened in 1952 noted that "the picture is in a remarkable state of preservation." This is partly due to the result of a variety of conservation treatments the painting has undergone. A detailed analysis in 1933 by Madame de Gironde revealed that earlier restorers had "acted with a great deal of restraint." Nevertheless, applications of varnish made to the painting had darkened even by the end of the sixteenth century, and an aggressive 1809 cleaning and re-varnish removed some of the uppermost portion of the paint layer, resulting in a washed-out appearance to the face of the figure. Despite the treatments, the Mona Lisa has been well-cared for throughout its history, and the 2004-2005 conservation team was optimistic about the future of the work. The back of the Mona Lisa showing the frame. At some point in its history, the Mona Lisa was removed from its original frame. The unconstrained poplar panel was allowed to warp freely with changes in humidity, and as a result, a crack began to develop near the top of the panel. The crack extends down to the hairline of the figure. In the mid-eighteenth to early nineteenth century, someone attempted to stabilize the crack by inlaying two butterfly shaped walnut braces into the back of the panel to a depth of about 1/3 the thickness of the panel. This work was skillfully executed, and has successfully stabilized the crack. Sometime between 1888 and 1905, or perhaps at some point during the picture's theft, the upper brace fell out. A later restorer glued and lined the resulting socket and crack with cloth. The flexible oak frame (added 1951) and crossbraces (1970) help to keep the panel from warping further. A butterfly brace prevents the panel from further cracking. The picture is currently kept under strict, climate controlled conditions in its bullet-proof glass case. The humidity is maintained at 50 percent ±10 percent, and the temperature is maintained between 18 and 21°C. To compensate for fluctuations in relative humidity, the case is supplemented with a bed of silica gel treated to provide 55 percent relative humidity. Because the Mona Lisa's poplar support expands and contracts with changes in humidity, the picture has experienced some warping. In response to warping and swelling experienced during its storage during World War II, and to prepare the picture for an exhibit to honor the anniversary of Da Vinci's 500th birthday, the Mona Lisa was fitted in 1951 with a flexible oak frame with beech crosspieces. This flexible frame, which is used in addition to the decorative frame described below, exerts pressure on the panel to keep it from warping further. In 1970, the beech crosspieces were switched to maple after it was found that the beech wood had been infested with insects. In 2004-2005, a conservation and study team replaced the maple crosspieces with sycamore ones, and an additional metal crosspiece was added for scientific measurement of the panel's warp. The Mona Lisa has had many different decorative frames in its history, owing to changes in taste over the centuries. In 1906, the countess of Béarn gave the portrait its current frame, a Renaissance-era work consistent with the historical period of the Mona Lisa. The edges of the painting have been trimmed at least once in its history to fit the picture into various frames, but none of the original paint layer has been trimmed. The first and most extensive recorded cleaning, revarnishing, and touch up of the Mona Lisa was an 1809 wash and re-varnish undertaken by Jean-Marie Hooghstoel, who was responsible for restoration of paintings for the galleries of the Musée Napoléon. The work involved cleaning with spirits, touch up of color, and revarnishing the painting. In 1906, Louvre restorer Eugène Denizard performed watercolor retouches on areas of the paint layer disturbed by the crack in the panel. Denizard also retouched the edges of the picture with varnish, to mask areas that had been covered initially by an older frame. In 1913, when the painting was recovered after its theft, Denizard was again called upon to work on the Mona Lisa. Denizard was directed to clean the picture without solvent, and to lightly touch up several scratches to the painting with watercolor. In 1952, the varnish layer over the background in the painting was evened out. After the second 1956 attack, restorer Jean-Gabriel Goulinat was directed to touch up the damage to Mona Lisa's left elbow with watercolor. In 2004 experts from the National Research Council of Canada conducted a three-dimensional infrared scan. Because of the aging of the varnish on the painting it is difficult to discern details. Data from the scan and infrared were used by Bruno Mottin of the French Museum's "Center for Research and Restoration" to argue that the transparent gauze veil worn by the sitter is a guarnello, typically used by women while pregnant or just after giving birth. A similar guarnello was painted by Sandro Botticelli in his Portrait of Smeralda Brandini (c.1470/1475), depicting a pregnant woman (on display in the Victoria and Albert Museum in London). Furthermore, this reflectography revealed that Mona Lisa's hair is not loosely hanging down, but seems attached at the back of the head to a bonnet or pinned back into a chignon and covered with a veil, bordered with a sombre rolled hem. In the sixteenth century, hair hanging loosely down on the shoulders was the customary style of unmarried young women or prostitutes. This apparent contradiction with her status as a married woman has now been resolved. Researchers also used the data to reveal details about the technique used and to predict that the painting will degrade very little if current conservation techniques are continued. 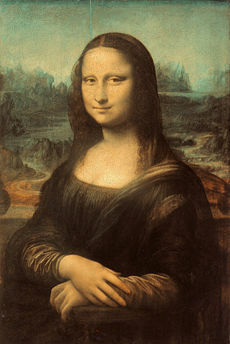 During 2006, Mona Lisa underwent a major scientific observation that proved through infrared cameras she was originally wearing a bonnet and clenching her chair (something that Leonardo decided to change as an afterthought). On April 6, 2005—following a period of curatorial maintenance, recording, and analysis—the painting was moved to a new location within the museum's Salle des États. It is displayed in a purpose-built, climate-controlled enclosure behind bullet-proof glass. About six million people view the painting at the Louvre each year. Crowd in front of Mona Lisa at the Louvre. Historian Donald Sassoon cataloged the growth of the painting's fame. During the mid-1800s, Théophile Gautier and the Romantic poets were able to write about Mona Lisa as a femme fatale because Lisa was an ordinary person. Mona Lisa "…was an open text into which one could read what one wanted; probably because she was not a religious image; and, probably, because the literary gazers were mainly men who subjected her to an endless stream of male fantasies." During the twentieth century, the painting was stolen, an object for mass reproduction, merchandising, lampooning and speculation, and was reproduced in "300 paintings and 2000 advertisements". The subject was described as deaf, in mourning, toothless, a "highly-paid tart," various people's lover, a reflection of the artist's neuroses, and a victim of syphilis, infection, paralysis, palsy, cholesterol or a toothache. Scholarly as well as amateur speculation assigned Lisa's name to at least four different paintings and the sitter's identity to at least ten different people. Visitors generally spend about 15 seconds viewing the Mona Lisa. Until the twentieth century, Mona Lisa was one among many and certainly not the "most famous painting" in the world as it is termed today. Among works in the Louvre, in 1852 its market value was 90,000 francs compared to works by Raphael valued at up to 600,000 francs. In 1878, the Baedeker guide called it "the most celebrated work of Leonardo in the Louvre." Between 1851 and 1880, artists who visited the Louvre copied Mona Lisa roughly half as many times as certain works by Bartolomé Esteban Murillo, Antonio da Correggio, Paolo Veronese, Titian, Jean-Baptiste Greuze and Pierre Paul Prud'hon. Prior to the 1962–1963 tour, the painting was assessed for insurance purposes at $100 million. According to the Guinness Book of Records, this makes the Mona Lisa the most valuable painting ever insured. As an expensive painting, it has only recently been surpassed (in terms of actual dollar price) by three other paintings, the Adele Bloch-Bauer I by Gustav Klimt, which was sold for $135 million (£73 million), the Woman III by Willem de Kooning sold for $137.5 million in November 2006, and most recently No. 5, 1948 by Jackson Pollock sold for a record $140 million on November 2, 2006. Although these figures are greater than that which the Mona Lisa was insured for, the comparison does not account for the change in prices due to inflation–$100 million in 1962 is approximately $670 million in 2006 when adjusted for inflation using the US Consumer Price Index. Although the sitter has traditionally been identified as Lisa de Giocondo, a lack of definitive evidence had long fueled alternative theories, including the possibility that Leonardo used his own likeness. However, on January 14, 2008, German academics of Heidelberg University made public a finding that corroborates the traditional identification: dated notes scribbled into the margins of a book by its owner on October 1503 established Lisa de Giocondo as the model for the painting. Other aspects of the painting that have been subject to speculation are the original size of the painting, whether there were other versions of it, and various explanations for how the effect of an enigmatic smile was achieved. In a National Geographic presentation titled "Testing The Mona Lisa" it was deduced, after rigorous assessment, that the figure depicted in the painting might be maternal, or pregnant. It was found, after extensive infrared reflectography, that Lisa herself had a haze around her clothing indictative of a guarnello, the attire worn by pregnant women. Another theory proposed by various health professionals was that Leonardo's representation of her hands as slightly 'large' was further indicative of Lisa's pregnancy. Conversely, as many scholars or persons suggest, this representation is merely a stylistic concept of beauty exemplified by numerous Renaissance painters, including Leonardo himself. The Mona Lisa has been the subject of numerous other works of art. It was immediately the subject of a painting of Raphael, who recognized its importance. However, it was not until the twentieth century that the Mona Lisa became "the most famous painting in the world." In 1878, the Baedeker Guide called it the "the most celebrated work of Leonardo in the Louvre." Between 1851 and 1880, artists who visited the Louvre copied Mona Lisa roughly half as many times as certain works by other painters such as Bartolomé Esteban Murillo and Antonio da Correggio. The avant-garde art world has taken note of Mona Lisa's popularity. Because of the painting's overwhelming stature, Dadaists and Surrealists produced numerous modifications and caricatures. Salvador Dalí, famous for his pioneering surrealist work, painted Self portrait as Mona Lisa in 1954. In 1963 Andy Warhol created serigraph prints of the Mona Lisa, in an effort to reduce her gravity to that of a disposable modern icon; to a similar cultural stature of the modern celebrities Marilyn Monroe or Elvis Presley. In addition to painting, the Mona Lisa has inspired other art through the ages. During the mid-1800s, Théophile Gautier and the Romantic poets considered Mona Lisa a femme fatale. There have been numerous songs and even an opera by the German composer Max von Schillings. ↑ 16.0 16.1 Top 25 Crimes of the Century: Stealing the Mona Lisa, 1911. TIME 2007. accessdate November 20, 2008. ↑ Faces of the week. BBC News 2006-09-29 Retrieved November 20, 2008. ↑ Mona Lisa gains new Louvre home. BBC News, 2005-04-06. Retrieved November 20, 2008. All links Retrieved November 20, 2008. Bartz, Gabriele. Louvre. Art and Architecture, 3C Publishing, 2006. ISBN 3833119438. Farago, Claire J. 1999. Leonardo's Projects, C. 1500-1519. Taylor and Francis, ISBN 0815329350. Kemp, Martin. 2006. 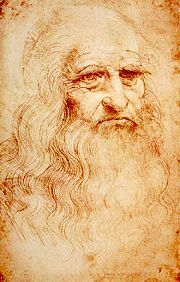 Leonardo Da Vinci: The Marvellous Works of Nature And Man. Oxford University Press, ISBN 0192807250. McMullen, Roy (1976). Mona Lisa: The Picture and the Myth. Macmillan Publishers. ISBN 0333191692. Turudich, Daniela. 2003. Plucked, Shaved & Braided: Medieval and Renaissance Beauty and Grooming Practices 1000–1600. Streamline Press, ISBN 193006408X. Wilson, Colin. 2000. The Mammoth Encyclopedia of the Unsolved. Carroll & Graf Publishers, ISBN 0786707933. This page was last modified on 13 October 2018, at 16:27.